During all three race days of the 76th annual Hahnenkamm Races: a performance by the Red Bull Skydive Team and flight formations with three fixed-wing planes are scheduled ahead of the Super-G start on Friday, 22nd January from 11 hrs (start 11.45 hrs). On Saturday, 23rd January, (Downhill start: 11.45 hrs) an aerobatic display with helicopters, B 25 Mitchell, P 38 Lightening, AJ-1 and AJ-2 are on the programme from 10.55 hrs. The Red Bull Skydive Team will land in the finish area just ahead of the second run of the Slalom (start 13.30 hrs) on Sunday, 24th January. 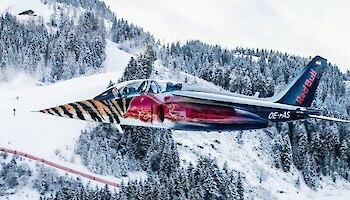 Spectators will be entertained with an impressive flight show during all three race days of the 76th annual Hahnenkamm Races: a performance by the Red Bull Skydive Team and flight formations with three fixed-wing planes are scheduled ahead of the Super-G start on Friday, 22nd January from 11 hrs (start 11.45 hrs). On Saturday, 23rd January, (Downhill start: 11.45 hrs) an aerobatic display with helicopters, B 25 Mitchell, P 38 Lightening, AJ-1 and AJ-2 are on the programme from 10.55 hrs. The Red Bull Skydive Team will land in the finish area just ahead of the second run of the Slalom (start 13.30 hrs) on Sunday, 24th January.